Russia and the EU close in on a solution to the final stumbling block of official passports. Moscow and Brussels now hope that a long-awaited visa agreement between Russia and the EU will be signed before the start of the summer. As part of an agreement to mutually liberalize visa requirements, Germany — the most influential opponent of the abolition of visas for holders of official passports — has withdrawn its objections. Moscow and Brussels now hope that a long-awaited visa agreement between Russia and the EU will be signed before the start of the summer. The nearly two-year dispute over visa exemptions for holders of official passports is seemingly about to be resolved. This issue has so far prevented the two sides from signing an agreement that would substantially relax the visa regime for all categories of citizens. 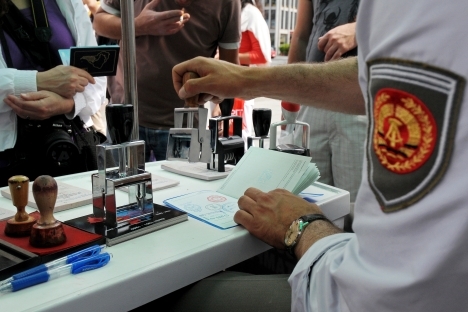 Moscow's demand that holders of such passports be exempt from visa requirements is opposed by a number of EU countries. However, according to a diplomatic source in Brussels, the most influential of these countries — Germany — recently changed its position. The source indicated that German Foreign Minister Guido Westerwelle and Interior Minister Hans-Peter Friedrich had informed European Commissioner for Home Affairs Cecilia Malmstrom of its new position in a special letter. The Embassy of Germany in the Russian Federation issued this statement: "The Government of Germany has always supported dialogue between the EU and Russia on a new agreement to facilitate the visa process. The German authorities are in favor of resolving the matter regarding the abolition of visas for holders of official passports." Diplomatic sources in the EU cite a number of reasons for Germany's sudden change of heart. "German business circles and tour operators have long advocated a simpler visa regime with Russia, believing that it will benefit economic ties and tourism," said one of the sources. "They have repeatedly expounded that view to the German government, which seems to have heeded their advice." Another source believes that the concession is intended to improve the overall climate of relations between Moscow and Berlin. The dialogue has been strained recently because of growing criticism of Russia by German officials. "Germany will go to the polls this year, and better relations with Russia could win votes for the ruling party," said this source, recalling that Chancellor Angela Merkel is due to meet with President Vladimir Putin in Moscow in the first half of April. According to a third source in Europe's diplomatic circles, Germany hopes that, if the visa regime is greatly simplified, "Russia will stop pushing for a total abolition of visas." Russia had been angling to have all visa barriers with the EU removed in time for the Winter Olympics in Sochi, but now hopes to reach an agreement by the end of 2014 at the latest. In any case, it largely depends on which EU countries decide to follow Germany's example. Besides Germany, the camp of skeptics includes Austria, the Netherlands, Sweden, Denmark, Czech Republic, Poland, Lithuania, Latvia, and Estonia, as well as Britain and Ireland (which are not part of Schengen but involved in the decision-making process). Two of them — Austria and the Netherlands — could soon withdraw their objections, which would effectively resolve the matter. The ambassador-at-large of the Russian Ministry of Foreign Affairs, Anwar Azimov, described Germany's decision as a "very positive step." "We are pleased that common sense has prevailed," said Azimov. "We hope that Germany's example will show the doubters how to conduct a constructive policy in relation to Russia, and that together we can overcome the remaining barrier to the signing of a new visa agreement." Azimov admitted that he did not know when the signing might take place. The relaxation of visa restrictions was discussed on March 11 in Moscow, during a visit by the director general of the European Commission for Home Affairs, Stefano Manservizi. The topic is also on the agenda of the meeting between the government of the Russian Federation and the European Commission, to be held on March 21-22 in Moscow. Anwar Azimov did not rule out that an agreement could be signed during the Russia-EU summit, which, according to Kommersant, is due to take place in early June in Yekaterinburg. A diplomatic source in Brussels also expressed hope that a document would be signed "before the summer vacation period." However, he issued a proviso: After being signed, the agreement must be ratified by the European Parliament. The latter has not been favorably inclined toward Russia as of late.